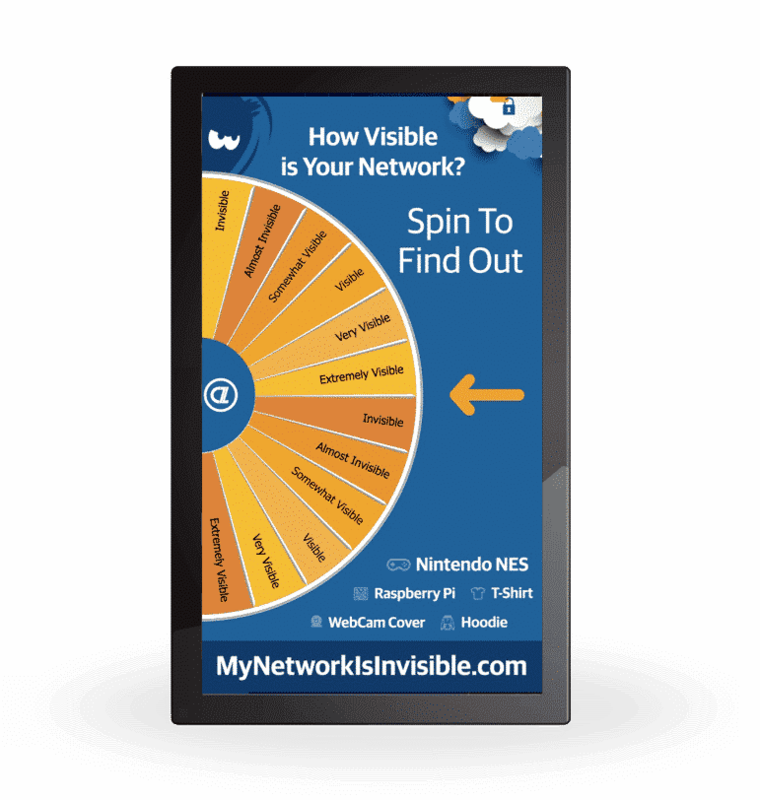 Brandable interactive games and activities for trade shows, customer and sales meetings that engage attendees and drive measurable business results. Drive Booth Traffic, Capture Leads and Measure Impact Across Shows. Create games and activities that drive booth traffic, capture leads and feed live display screens in your booth. Switch solutions from event to event or reuse the same solution for the full season. Compare results across multiple events to measure your impact. Create games and experiences that connect attendees to content. Use our platform for interactive Q&A, live polls, trade show passport games, social media walls or event gamification solutions. While you engage your attendees in content based conversations, use the data to drive marketing next steps with customers or measure sales training. Turnkey solutions when custom development won’t work. When time and money are obstacles, we are here to help. Using our platform, you can deploy games and activities in your clients trade show booths and events faster than before. We will setup the games while you take care of the rest. Choose your event. Define your experiences. Using our SocialPoint Audience Engagement Platform, we can brand, style and configure over 25 different audience engagement games and activities for mobile phones, tablets or big screens – without doing any programming. 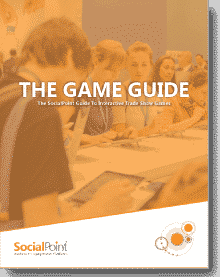 In February 2018, SocialPoint’s Digital Fishbowl won the ExhibitorLive Buyer’s Choice award at the show for best new product innovation in the trade show industry. 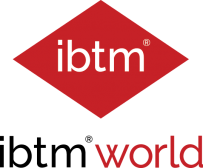 In November 2015, IBTM World (formerly EIBTM) selected our SOCIALPOINT® Audience Engagement platform as one of the Top 10 new innovations of 2015. 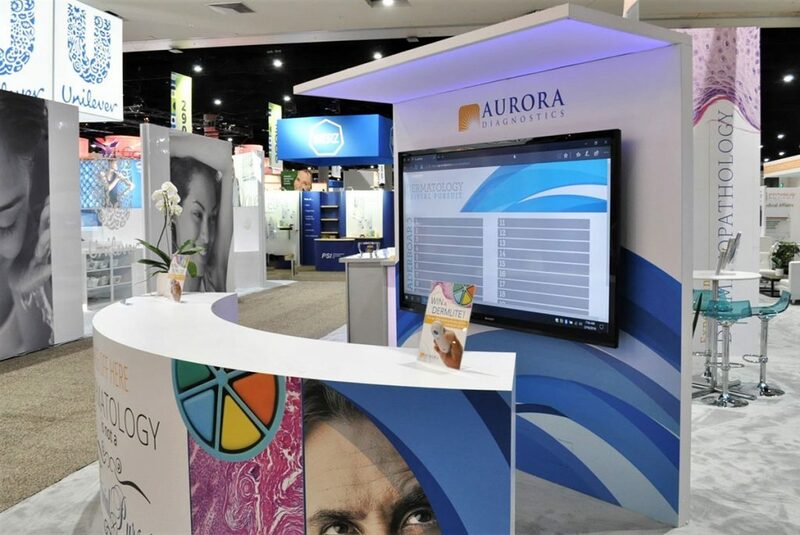 At AAD 2019, Aurora Diagnostics had similar strong results, with 320 unique game players, who played 551 games, and answered 9,632 trivia questions. Getting the game set up was “a seamless process that SocialPoint walked us through,” said Rosenberg. To make the game quick (and not overdo attendees’ limited attention-span), Stacey asked SocialPoint to limit the game plays to 3 minutes. “SocialPoint did have other options, but I thought this was best for us,” said Rosenberg. Players could play individually rather than wait for other players before starting. This also let more people play the game. People who wanted to play more could simply play the game again. For visibility, both years the game was set up on the booth corner on the main aisle. In 2018, Aurora Diagnostic’s exhibit counter supported 6 game iPads. Counter graphics promoted the trivia game with the words, “Faceoff here – Dermatology is not a Trivial Pursuit.” Aurora Diagnostics also had matching page-sized graphics atop the counter showing the Dermlite they could win by playing the trivia game. “We gave Dermlites to the top 3 people per day on the leaderboard,” recalled Rosenberg. 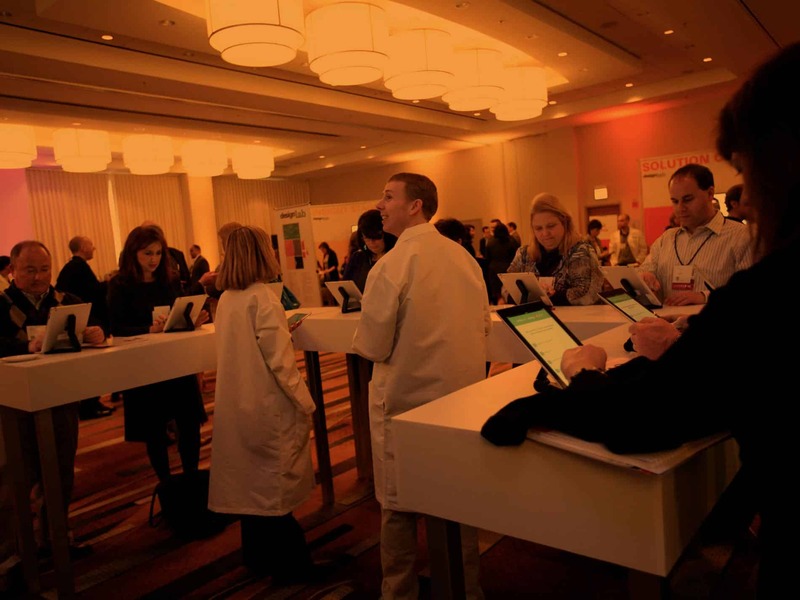 At the 2018 AAD Show, Aurora Diagnostics set up their first SocialPoint Trivia game on the corner of their booth on the busiest aisle to grab more attention and booth traffic. In 2019, rather than put the game player iPads on a counter, Aurora Diagnostics put their 6 game iPads on kiosks, which made it easier for players to approach and see the game leaderboard. 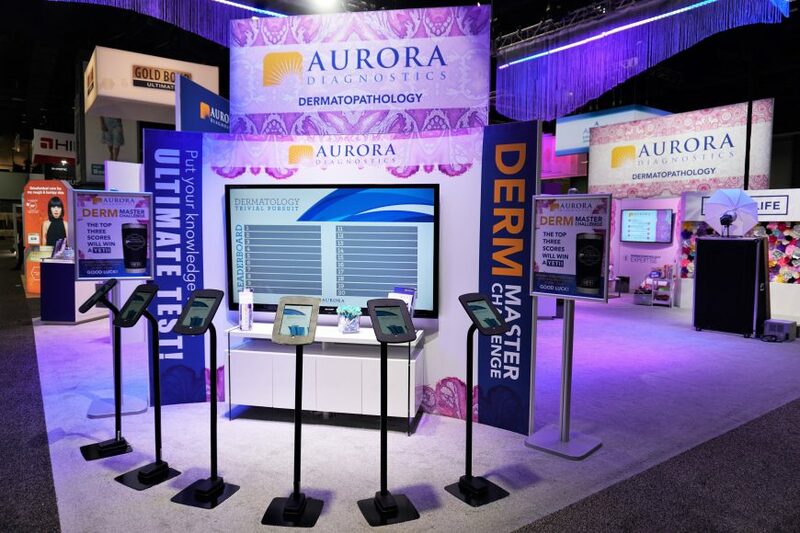 They renamed the game “DERM Master Challenge.” Aurora Diagnostics also promoted game with graphics on their exhibit components, and with 2 larger signs saying, “The top three scores will win a YETI” that included a photo of the prize. “The custom Yetis cost us only half as much as the Dermlites, but were an equal draw for attendees.” Aurora Diagnostics also used the trivia game as a “gate” to visit the candy bar they had in their booth, further motivating attendees to play their game (and learn more about their products). After successes at AAD 2018 and AAD 2019, what will Aurora Diagnostics do for AAD 2020? I have an alternative point of view. Your Audience Poll: Most of you will achieve 60-85%. The people who don’t participate either are not interested or didn’t get the tech to participate. Your Scavenger Hunt Game: I recently heard about a game that got 90% participation but most participation rates are much lower. More like 20%-30%. 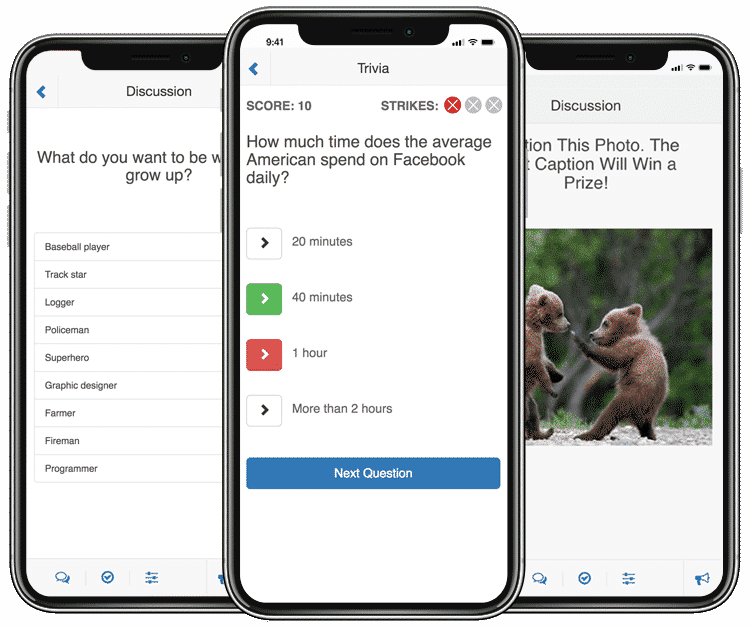 Your Trivia Game: I have some clients who get 50-70% of attendees. We do have clients that get more – but those are exceptions. Your Social Media Wall: The level of participation depends on the audience demographics and the calls to action that the event organizer creates. Many get about 20-30% participation in a conference or event – without encouraging participation or showing the social screens in large public places. However – the people that are into it are really into it. Your Mobile Event App: Because it will only be used for a few short days – I have never heard of any event getting 100% of the attendees to download the mobile event app. It’s a huge effort to visit the app store to download, install, and login. I am constantly surprised by the low numbers of usage of these apps. Creators – This is the person that can take a white piece of paper and make something magical out of it. They represent about 10% of your audience. Collectors – These are the people that like to collect a set of something. You know they want all the badges, or to get to all of the stations, etc. These people are about 25% of your audience. Sharer – These people prefer to share the ideas of others, rather than come up with their own. Joiners – These people like to join. Sign up for this, that and the other thing. Inactives – These people don’t want to get involved. They want to try and hide. They represent about 20% of your attendees. Now the percentages are just rough estimates – some crowds vary in size. In our experience – if you use these numbers as a guide post – you can increase your outcomes. Knowing that, if only 10% of the audience willing to create videos and other content, you’re winning! Even though almost everyone carries an astounding content-creating tool called a smart phone in their pocket, they won’t all want to use it. Sure, they’d love to see a picture of themselves with their arm around their friend’s shoulder, but 90% won’t go to the effort to create videos. You can increase your overall participation rate by giving opportunities and rewards for attendees to behave the way they prefer, whether it’s to create, critique, collect, share, or join. Also, rather than trying to get maximum involvement within a single session or workshop, instead go for layered engagement. When designing your meeting, we have different types of activities that appeal to these different audience behavior types. Sprinkle these different kinds of engagement activities throughout your one day or multiple day event. Eventually you’ll get a higher percentage of your audience participating, just not all at the same time. So, you’re not going to get every attendee to create, but if you can focus on appealing to these different groups and accepting the percentages won’t reach 100 percent but perhaps 30 or 50 percent, you will succeed. Our award-winning game just got even better. 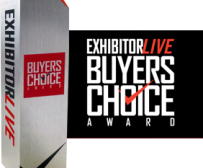 Our Digital Fishbowl Game won the Buyers Choice Award last year at EXHIBITORLIVE 2018, as an easy kiosk game that motivated attendees to self-enter their lead data to win a prize. Now we’ve radically expanded the capabilities of this game to create engaging, big-screen digital content, too. Here’s how it works: As attendees enter their contact info on iPads or other tablet computers in order to win a prize, they also engage in one of 5 possible activities (listed below). It’s very quick for them to answer a question. Their answers create digital content that displays on a large results screen. Most attendees will want to make their contributions to the digital content. But for those that don’t, the digital content on the big screen is still a great icebreaker for booth staffers, who can ask attendees which answer(s) they like best, and why. Ask visitors to choose what’s their biggest challenge, goal, or desire from up to 5 possible answer choices. Poll results are immediately visible in a cool chart on your big monitor screen, and constantly updated as new attendees take the poll. 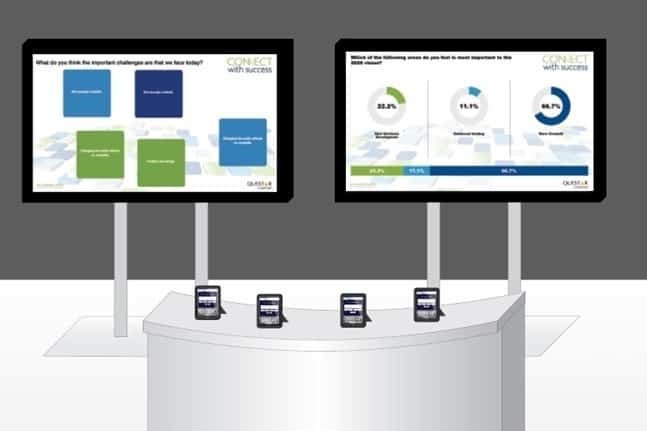 Set up live polls ahead of time or on the fly in your booth. Ask booth visitors for words that best describe their main challenge, their job, the product category you market to, and more. Put results on the big screen to stop attendees and start conversations. You get a great interactive, and insight into the language your prospects use. Ask attendees for their ideas on a relevant subject to your booth experience, such as what new product would they like to see from your company next. Attendees’ answers are shown on the results screen, and you can download the attendees’ ideas after the show. Let attendees vote on ideas you already have captured, such as what product idea they like best, or what tagline best describes your company brand. Results on the screen give you great talking points with all your booth visitors. Put up fun photos for attendees to caption. Then choose the best captions to display in your booth on a scrolling screen. This entertaining activity helps break the ice with attendees. You can ask attendees to give you their best guess on the number of something you have in your booth, such as the pieces of candy in a jar. The Digital Fishbowl records attendees’ answers with their names, so you can quickly look up who is closest to the right answer and name the winner. You can add a single question to the Digital Fishbowl kiosk screens that booth visitors must answer correctly in order to go on to the next step, be it eligible to win a prize or prove their knowledge. 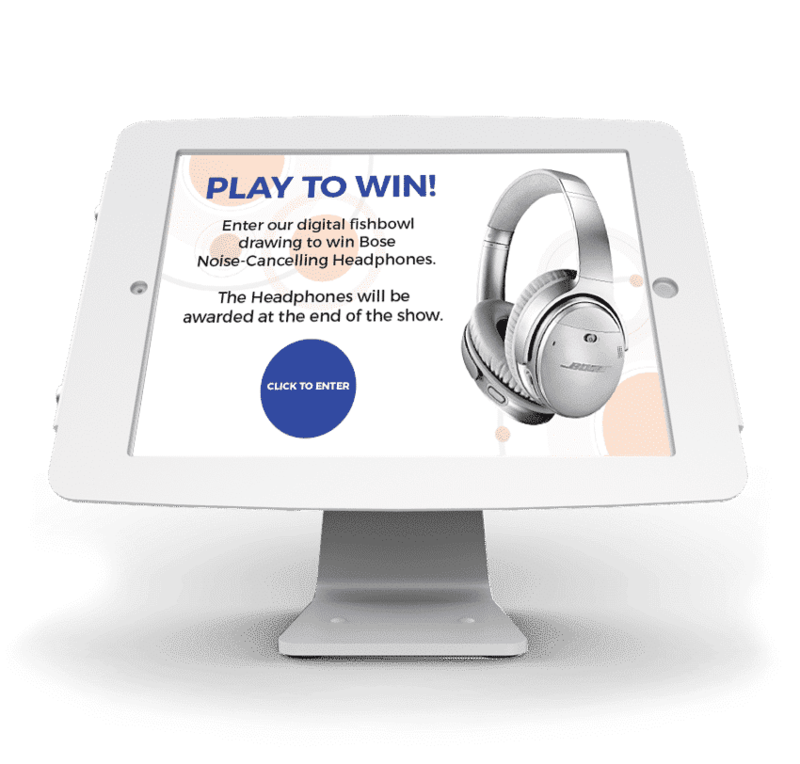 If you are looking for a simple way to create digital interactive content that’s easy to implement, customized to each show’s attendees, and helps boost your tech image, then consider the enhanced Digital Fishbowl game. You’ll get more traffic and engagement as you offer up your prize drawing.